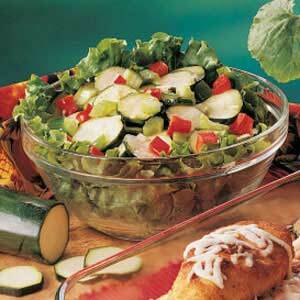 Zucchini is a summer squash and is treated as a vegetable. However, zucchini is a fruit, being the swollen ovary of the zucchini flower. Zucchini has its ancestry in Americas but many varieties were developed in Italy after their introduction from the Americas. 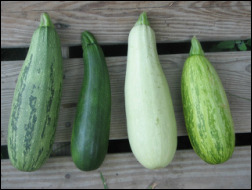 Zucchini is cylindrical and can grow from 4” to 24” and range in color from dark to light green. Zucchini is low in calories and contains useful amounts of folate, potassium, vitamin A and vitamin C. Zucchini can be used in baked goods, desserts, salads, main dishes, appetizers, and soups. It can be made sweet or savory. It can also be used in many international dishes such as Italian, Mexican, Thai, and many others. A few new recipes will be shared this month to get you started on making zucchini a staple in your diet. Combine above in a bowl. 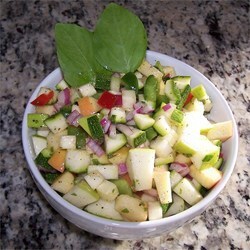 Drizzle over zucchini-apple mixture. Toss to coat. In a mixing bowl, soak onion soup mix in wine vinegar, let stand 5 minutes. Chill 4-6 hours, stirring occasionally. Drain off any extra liquid before serving. To prepare crust: Squeeze moisture from the zucchini. 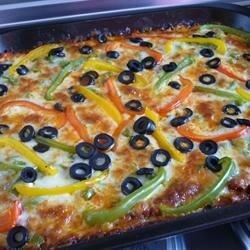 Combine zucchini and remaining crust ingredients. Press into a 9”X13” pan. Bake at 350 degrees for 30-35 minutes. Sprinkle with toppings, spoon sauce over top. Sprinkle with grated cheese and oregano. 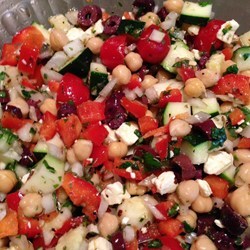 Directions: Mix zucchini, chickpeas, tomatoes, red bell pepper, onion, feta, Kalamata olives, olive oil, basil, vinegar, rosemary, garlic, oregano, red pepper flakes, salt, and black pepper together in a large bowl. Refrigerate several hours before serving.